Do you think your knowledge is as exact as the 9.15 train? Or are you in need of some of Mother’s much loathed lessons? Try this multiple-choice quiz and find out! What is it that Bobbie discovers Father has been wrongly accused of? What is the name of the friendly railway porter that the children become so fond of? What food does Peter demand from his mother when he feels unwell? How do the children manage to save the train as it speeds towards the landslide? Who is it that manages to find a way to free Father? What is the name of the house the children move to? What is the name of the baby saved by the children from the burning canal boat? What are the names of the two types of competitors in a game of paperchase? Roberta, Phyllis and Peter have their comfortable lives in London thrown into disarray by the unexpected disappearance of their father. They are forced to move to a small cottage in the countryside with their mother, who struggles to make ends meet by writing books. The children find solace in a stretch of railway track and the station nearby, and befriend the railway porter, who teaches them about running the station, and an old gentleman who takes the 9.15 train every day. Through this love of the trains they are led on many exciting adventures, including a quest to discover the secret of their father’s disappearance. 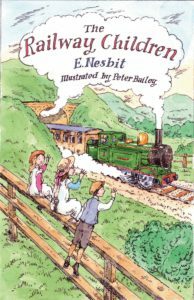 One of the most popular children’s books ever written, E. Nesbit’s tale has enchanted generations of readers since it was first released in 1906. It has been adapted for the screen and the stage many times, and its story of innocence, intrigue and discovery remains perfectly poignant today.